The biggest mistake here is simply to not try stuff. I've never been taught the stuff I play on my uke...it comes from hours of messing around until something sounds cool. There are only 4 strings on a uke, so making up patterns is easy. I plant my pinky finger on the body of the uke, and then my other four fingers each get a string as shown on the picture below (T=thumb, I=index, M=middle, R=Ring). Every time I pick up my uke, I make up different patterns and come up with new ideas, but I'll give you some of my very basic favorite patterns and moves (little snippets if you will). How you put them together is up to you. 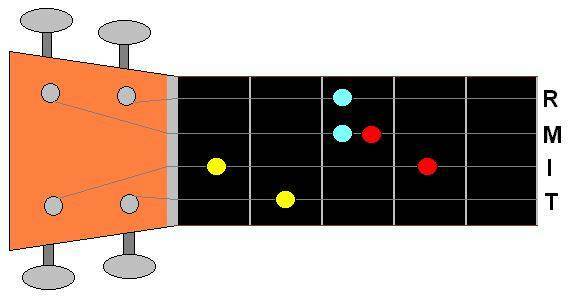 The chord I will use for my examples is the E chord (on the baritone) signified by the yellow dots. The blue and red dots are just notes from the pentotonic scale that I use a lot, and will use in the example below. If you put the ideas here together with the understanding of bar chords you can quickly see that these moves work anywhere on the neck, as long as you have your bar finger down. Learn and practice them in the open position first. In the examples below the picture, brackets  mean to pick the strings together at the same time. po means to finger the note(s), pluck the string(s), then immediately pull-off your finger(s) from the string(s). ho means to pluck the string(s) open, then immediately hammer-on your finger(s) onto the string(s) as hard as you can. So, get your uke, fret the yellow dots, and try some of the blues moves below.